Pippa Middleton stole the style spotlight at a society wedding over the weekend, stepping out in a pretty peplum dress by Tabitha Webb. The youngest Middleton sister set flashbulbs alight at the nuptials of Lady Melissa Percy and Thomas van Straubenze, held at St Mary’s Church in Alnwick, Northumberland. Pippa joined Princes William and Harry, as well as Harry’s ex-girlfriend Chelsea Davy, and reported current love interest Cressida Bonas, at the society ceremony on Saturday. It’s thought pregnant Kate Middleton stayed at home. Stealing the style spotlight away from other guests, Pippa Middleton was the centre of attention in the printed Tabitha Webb creation, from the former Project D designer’s A/W ’13 collection. 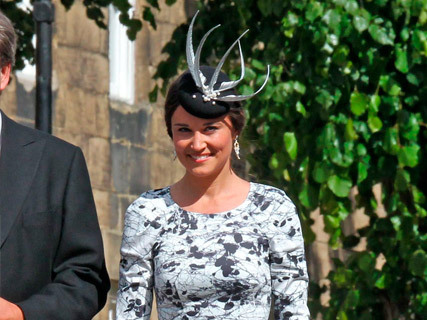 But we couldn’t help thinking we’d seen Pippa’s peplum number before. That’s because Celebrity Juice presenter Kelly Brook stepped out in the very same ensemble just a few weeks before. While Kelly wore hers with towering platform heels and a shiny Chanel clutch, Pippa teamed her floral look with Noah black stiletto pumps by Gucci, and a jaunty statement Olivia Roat Millinery hat. This isn’t the first time Pippa Middleton has been spotted in one of Webb’s designs. The socialite wore a pretty pink dress by her design to the Waitrose summer party last month, and a dress by her former Project D label to Wimbledon in 2012.